Buying a Car to Travel New Zealand Part 2: How? Maraehako Bay Resort. Amazing place to stay with the waves lapping on the shore metres from the car. Photo by Steve Collier, 2014. In our previous post, we covered why, in our opinion, it’s a better idea to buy a car to travel New Zealand in than to rent or use public transport. We’ll now talk about how we researched the best car to buy, the process of buying it and all related aspects of the process we have so far encountered. There are three reliable methods we used to hunt down a car which would be right for us while in Auckland at the beginning of our New Zealand adventure. Any one of them could have proven successful but it’s best to try all of them as not all cars are listed in all of these places. You could try car auctions or sales garages but you’re not likely to find the best deal here. Private sales are the way to go. 1. 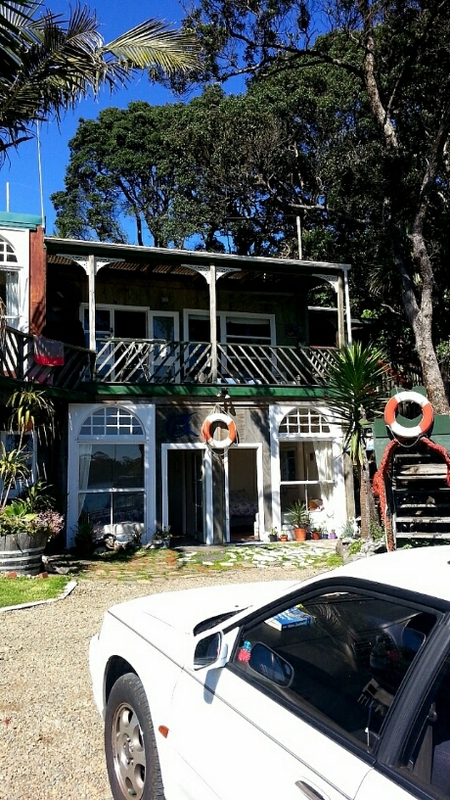 TradeMe. This is essentially the Kiwi eBay and is a pretty easy way to use. You simply set your search parameters regarding location, price limit, buying method (buy now/ auction), vehicle type etc and the results are there on screen for you to peruse. The best sellers will have a bunch of in depth photos and details on the specifications and condition of the car for sale. The more detail, the easier it is to compare but don’t forget the seller is only a phone call or email away for any questions you have and you can arrange a viewing time if you’re interested. You might even be able to barter the price down a bit if you think the car needs work or if they’re desperate to sell. 2. Roadside sales. You’ll be amazed at how many cars you’ll see on the side of the road with “for sale” notices emblazoned on them. Perhaps it’s simply not something we’re used to with the UK banning these type of car sales but they’re everywhere, especially during shoulder seasons when the snow/surf junkies head off to colder/warmer climates. Essentially this works the same as any other sale except you might have the opportunity to buy it then and there if you’re lucky and the owner is ready to let it go. It’s a good opportunity to have a proper look at what you’re buying without relying on online photos which will have obviously show a tidier version of the vehicle with muddy boots removed from the backseat. 3. Hostels. Many hostels will have a book or folder featuring a number of adverts for car sales. They’re not always updated regularly however and many of the owners we contacted had already sold their cars. If you team up with a group of other travellers to buy a camper for a trip though it would split the costs for sure. Just make sure you’re really good friends though and you write up some kind of makeshift contract however as financial disagreements when reselling the car would not be ideal. A lot of second hand vehicles will come equipped with camping and cooking equipment as their previous owners leave the country for other shores. This can work out as a really handy way to acquire everything you need for your travels around NZ with little or no extra cost. Like we said in our previous post, we received a good mattress, gas stove, extra gas cans and a fold out camping table all of which have been used multiple times. Ultimately, we found a great deal on TradeMe and there were a few other options we would have looked at had we not decided on our Subaru! After choosing your car, it’s time to make contact. Do this ASAP as good deals will most likely be being viewed by multiple people. Ask to have a thorough viewing of the car and see any documentation regarding ownership, maintenance, Warrant of Fitness checks and any other related paperwork. Warrant of Fitness is basically like an MOT in the UK where every six months you are required to have your car checked for problems and then get the sorted. A valid WOF sticker is required by law to be shown on the front window of the car. Try finding a car with a relatively new WOF as this means there’s a shorter amount of time for the car to have developed problems before you buy it. Another piece of information you’ll need to display is your Vehicle License or “Rego” which is basically allowing you to use your vehicle on the road. Again, see when the Rego on the car you’re looking at expires. It’s pretty cheap to extend if needs be. Likeminded travellers from the Czech Republic we met on our way to Cape Reinga. 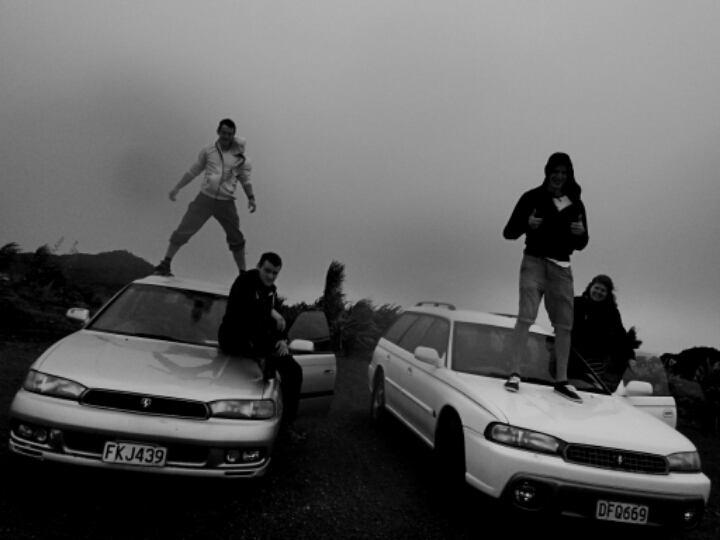 Standing on top of our cars on a hill in the middle of a storm. Because why not! Photo by traveller whose name escapes us, 2014! Ask to have a test drive and see if the seats are comfortable enough for the long drives you’ll no doubt be taking on from time to time. Does the car perform well up steep hills? Does the steering wheel pull to one side when driving in a straight line? Driving in New Zealand will expose you to a huge variety of terrain and challenges as a driver. A lot of roads are unsealed (the war zone-like East Cape being a prime example) with huge potholes that sometime run the width of the lane. Land slips, gravel, ultra-steep hills, hairpin turns, badly signed roadworks, ice, snow, stream crossings and even sand if you take some of the beach roads. Apart from ice, these are all conditions we encountered in the first month of being in the country. You have to be certain the car isn’t going to fall apart as soon as you hit rough terrain. When having a look at the car, be sure to check tyres, oil, rust, general wear and tear, the exhaust and anything else. There are plenty of articles online regarding car maintenance which are far more knowledgeable than us! You can try and barter a little bit to perhaps knock off a couple of hundred bucks if there’s something wrong that wasn’t advertised and always ask if the owner can have any repair work done before you buy if you pay the full asking price. If you decide to buy the car, perhaps force yourself to take a half hour to sit, have a coffee and think it over. It can be an easy reaction to get excited with a new toy and confirm the sale immediately and you might have overlooked something. The owner may ask to put a holding deposit (no more than NZD$50 should be ok) where by they’ll take it offline so as not to have other offers come through. If this happens, make sure you take copies of their I.D and a written receipt for the deposit. So, you’ve mulled over a flat white and you’re ready to buy. What next? It’s time to transfer the money and keys. Again, make sure you get a written receipt of sale and I.D. information. The seller will then need to fill out a “Notice of person selling/ disposing of vehicle form (MR13A)” and you will need to fill out a “Notice by person acquiring motor vehicle form (MR138).” Do this as soon as possible. If you don’t have a permanent address in NZ, usually hostels will allow you to use their address or if you have a friend there, you can use theirs if it’s ok with them. We used the latter option and we’re sure they’re really happy about the stack of mail awaiting us on our return to Auckland! It’s best to have these forms sorted out either in physical paper form, or online before exchanging keys but we simply trusted the guy selling his car to us and everything was sorted perfectly. A rare patch of good road on the way to the Eastern Cape! Photo by Nicola Attridge, 2014. One other thing. Car insurance is not mandatory in New Zealand! This seems mad and it kind of is. Please make sure you get it anyway. If you have an accident then you’ll be paying the full amount out of your own pocket and you can forget about continuing your travels. Also, it’s a good idea to get AA breakdown cover. There are a lot of middle of nowhere roads in New Zealand and if you break down you’ll need cover to have your car fixed/towed. Thoroughly inspect the vehicle and all paperwork relating to it. Happy driving! There’s plenty of information on the NZ Transport agency website and a great guide for backpackers buying vehicles here. Any questions or tips of your own? Don’t hesitate to get in touch in the comments below or via our Facebook page. 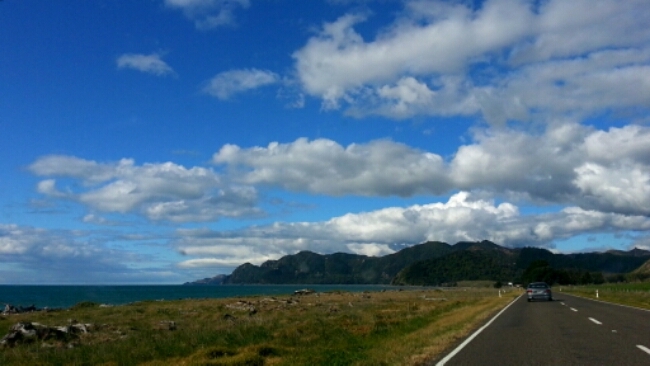 ← Buying a Car to Travel New Zealand Part 1: Why?